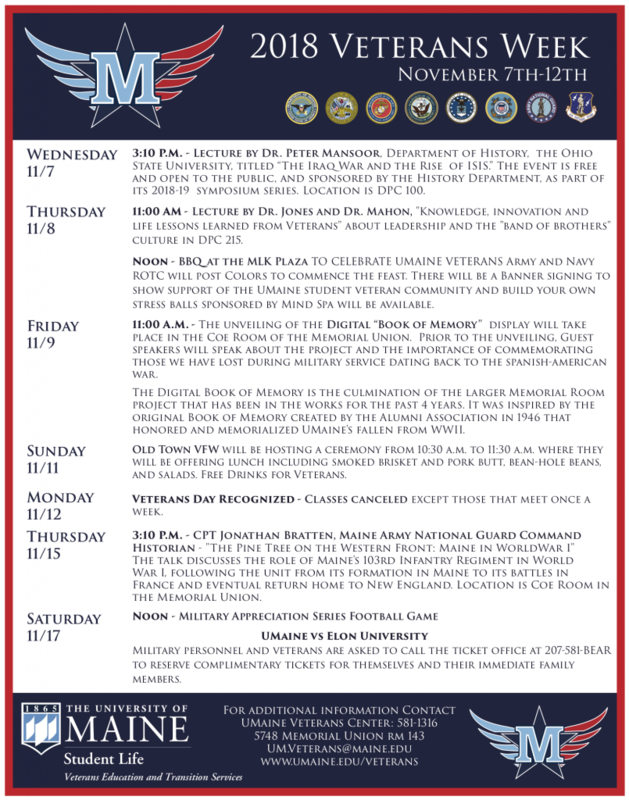 The University of Maine will recognize veterans with a week of events to coincide with Veterans Day, Nov. 12. The activities are coordinated by the UMaine Office of Veterans Education and Transition Services (VETS) and UMaine Veterans Association. 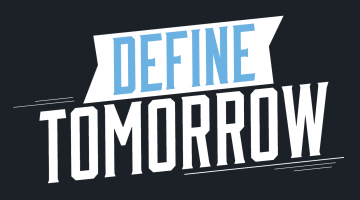 UMaine Veterans Week activities will include the unveiling of the Digital Book of Memory at 11 a.m. Nov. 9 in the Coe Room of Memorial Union. The Digital Book of Memory contains portraits and obituaries of UMaine’s 261 fallen dating back to the Spanish-American War. It is the culmination of a larger Memorial Room project and was inspired by the original Book of Memory created by the University of Maine Alumni Association in 1946 that honored and memorialized UMaine’s fallen from World War II. Prior to the unveiling, guest speakers will talk about the project and the importance of commemorating those lost during military service. Classes, except those that meet once a week on Fridays, are canceled on Monday, Nov. 12 in observance of the holiday. 3:10 p.m. Wednesday, Nov. 7 — Lecture by retired U.S. Army colonel and military historian Peter Mansoor titled “The Iraq War and the Rise of ISIS.” The event is free and open to the public, and sponsored by the UMaine History Department as part of its 2018–19 symposium series. The lecture in 100 D.P. Corbett Business Building will be followed by a question-and-answer session. 11 a.m. Thursday, Nov. 8 — “Knowledge, Innovation and Life Lessons Learned from Veterans,” a lecture by Maine Business School professors Nory Jones and John Mahon. The talk on leadership and the “band of brothers” culture will be held in DPC, Room 215. Noon Thursday, Nov. 8 — Barbecue at MLK Plaza to celebrate UMaine veterans. Army and Navy ROTC will post the colors to commence the feast. There will be a banner signing to show support of the UMaine student veteran community. Build- your-own stress balls sponsored by Mind Spa will be available. 10:30–11:30 a.m. Sunday, Nov. 11 — Ceremony hosted by Old Town VFW. Lunch including smoked brisket and pork, bean-hole beans and salads will be available, with free drinks for veterans. Following Veterans Week, the UMaine Black Bears Military Appreciation Series will offer free tickets to the football game against Elon University at noon Nov. 17. Military personnel and veterans can call 581.BEAR to reserve complimentary tickets for themselves and immediate family members.